On July 29, 2011, a 53-year-old career lieutenant (the victim) died from injuries he received after a vehicle he was performing maintenance on crushed him. The victim had lifted the vehicle with a portable floor jack. While on a creeper, the victim positioned himself under the vehicle and was preparing to remove the oil drain plug when the vehicle came down on him. Fire fighters within the station came to check on the victim and discovered that the jack was no longer supporting the vehicle and the victim was motionless under the vehicle. The fire fighters quickly repositioned the jack and attempted to raise the vehicle but the jack failed to support the vehicle’s weight. The fire fighters had to use hydraulic spreaders to raise the vehicle off of the victim. The victim later died at the hospital from injuries sustained during the incident. View of incident scene after the victim was removed. No established preventive maintenance program. Develop, implement, and enforce a comprehensive preventive maintenance program that includes safe work practices. Consider establishing a centralized fleet maintenance facility responsible for all preventive maintenance of all public service vehicles operating within their jurisdiction being sure to develop, implement, and enforce policies/procedures that outline safe work practices during vehicle maintenance. Spreaders were used to lift vehicle off the victim. On July 29, 2011, a 53-year-old career lieutenant (the victim) died from injuries he received when a vehicle he was performing maintenance on crushed him. On August 1, 2011, the U.S. Fire Administration notified the National Institute for Occupational Safety and Health (NIOSH) of this incident. On August 7–10, 2011, a safety and occupational health specialist from the NIOSH Fire Fighter Fatality Investigation and Prevention Program traveled to Massachusetts to investigate this incident. The NIOSH investigator met with the fire chief, deputy chief, representatives from the local fire fighters’ union, and the local police department. Interviews were conducted with the deputy chief, one of the fire fighters who discovered the victim, and the investigating police officer. The NIOSH investigator visited, documented, and photographed the incident scene. The NIOSH investigator also visited the local police department to inspect and photograph the vehicle and the portable jack involved in this incident. The NIOSH investigator reviewed the victim’s training records, the fire department’s policies and standard operating procedures (SOPs), and local police department’s photos and final incident report. This career fire department has 1 station with approximately 20 members (permanent, special duty, or on-call), which serve a population of over 8,000 within an area of about 16½ square miles. The fire department provides fire and nontransport EMS services within a coastal community. At the time of the incident, the fire department operated with three engines, a 100-ft aerial ladder, a brush truck, and two quick-response vehicles. The fire department currently operates a day shift from 0800 – 1800 and a night shift from 1800 – 0800. The permanent fire fighters work 40 hours a week and are responsible for covering the day shift. The permanent fire fighters work alternating days Monday through Friday, but also work one Saturday a month. The special duty fire fighters are responsible for covering the night and weekend shifts, working 24-48 hours a week. The paid on-call fire fighters work as necessary for call backs (special incidents) or to cover sick or vacation time taken by the permanent or special duty fire fighters. The fire department maintains minimum staffing at 3 personnel per shift. The fire department has multiple policies and SOPs governing daily operations, administrative requirements, and emergency response. The fire department does not have SOPs governing vehicle maintenance nor an established preventive maintenance program. Some handwritten vehicle records were kept within a notebook, but these records did not appear to be complete. The fire department has performed preventive maintenance on their apparatus since the 1970s, and this process continues today due to budgetary reasons. This preventive maintenance included such things as oil, filter, tire, and wiper blade changes; brake work; light bulb replacement; minor engine work; and minor apparatus fixture repairs. However, nonroutine maintenance work or repairs are sent to an outside vendor. Fire department members were not allowed to work on fire department vehicles unless they were overseen by the victim, who was responsible for the department’s vehicle maintenance. Also, fire department members could not work on their personal vehicles on fire department property. The fire department has a designated maintenance room for storing tools, spare parts, and supplies for anything that could require maintenance such as vehicles, self-contained breathing apparatus, hose appliances, and the fire station itself. The fire department does not have a vehicle maintenance facility where preventive maintenance on vehicles can be conducted. The fire department would routinely work on fire department vehicles within an available apparatus bay or outside on the paved parking lot. The town’s department of public works, located adjacent to the fire station, has their own vehicle maintenance facility with a pit for doing undercarriage work, such as oil changes. The fire department had never used this facility. In 1982, the victim started his career with this department as a paid on-call fire fighter until his appointment as a permanent fire fighter in 2003, at which time he was placed in charge of vehicle maintenance for the department. He was promoted to the rank of lieutenant in 2008 and continued his responsibilities in handling all vehicle maintenance and records. The victim did not hold any automotive maintenance certifications, nor did his position require him to have or obtain any. His qualifications for this position came from personal experience and knowledge, previous work experience (construction vehicles), and a side job at a small vehicle maintenance shop, once owned by the current fire chief. The victim held current fire service certifications and training in emergency vehicle operations, hazardous materials response, the incident management system, and fire fighting. The vehicle involved in this incident was a 2007 full-size sport utility vehicle with a gross vehicle weight rating of 7,550 pounds. After the incident, the fire department weighed the vehicle and determined the weight on each wheel was as follows: left front wheel, 1,600 pounds; right front wheel, 1,450 pounds; left rear wheel, 1,600 pounds; and right rear wheel, 1,500 pounds (see Photo 1). The weight of the vehicle does not appear to have been a factor in this incident. Photo 1. Vehicle involved in incident. The recommended tire size for this vehicle was P265/70R17 and was observed on the vehicle at the time of the incident. The fire department recently took possession of the vehicle and had not yet placed it in service when the incident occurred. No fire/EMS equipment or emergency lighting equipment had been placed on the vehicle. A hydraulic, portable floor jack, believed to have been purchased in 2008, used during this incident was a 3½-ton (7,000-pounds) capacity floor jack measuring approximately 5 inches by 11 inches by 26 inches (see Photo 2). The jack had rotating 2½-inch metal casters located at the handle end of the jack and stationary 3-inch metal wheels located at the lifting arm end of the jack. A manual pump arm handle would move a small-diameter piston, which pushed and pressurized the hydraulic fluid into a larger-diameter piston, which then pushed against a lever, lifting the main lift arm (or saddle). Note: The handle needed to be turned clockwise to lock the arm (close the relief valve) in place and counterclockwise to unlock the arm (open the relief valve). The pump arm handle measured approximately 48 inches long, which provided more leverage and lift per stroke. The jack was routinely used by the victim to work on vehicles, and fire department members do not recall any problems associated with the jack prior to the incident. Photo 2. Portable floor jack used during the incident. Two jack stands, rated for 4 tons (8,000 pounds) each, were available within the maintenance room, but not used the day of the incident (see Photo 3). The base of the jack stands measured 6¾ inches by 9 inches and the retractable support measured 4 inches by 2½ inches, with a maximum elevated height of 19 inches. 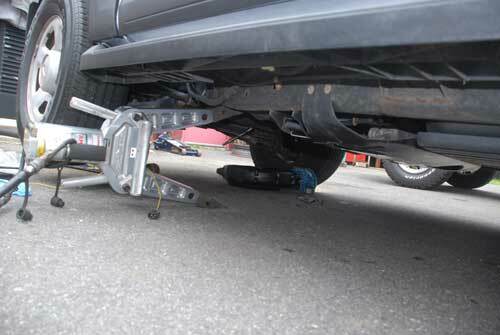 The jack stands were observed to be in good repair and operated correctly when raised. A creeper was used by the victim to work under the vehicle when the vehicle was raised. The creeper (positioned on casters) measured approximately 39 inches by 16¾ inches by 3½ inches (see Photo 4). The vehicle had an overall ground clearance of approximately 8½ inches, but only 5 inches of clearance were noted when the creeper (without anyone on it) was staged in the area of where the victim was found (see Photo 5). Photo 4. Creeper used by victim during the incident. This timeline is provided to set out, to the extent possible, the sequence of events according to fire department members working the day of the incident. Times are approximate and were obtained from witness interviews and the local police department’s report. Times have been rounded to the nearest minute. This timeline is not intended, nor should it be used, as a formal record of events. The victim had a conversation with on-duty fire fighters regarding the oil he had purchased for the vehicle. The victim was observed sitting in the dispatch office speaking with the dispatcher. The victim left the dispatch office and is believed to have gone to work on the vehicle. The dispatcher went to the back parking lot to speak to the victim, but he did not respond. The dispatcher looked under the front of the vehicle, discovered the victim was unconscious, and quickly ran back into the fire station to let the on-duty fire fighters know. Fire fighters discovered the victim unconscious and pinned under the vehicle. It was reported to the NIOSH investigator that the victim was wearing a duty uniform. The incident occurred during the day and outside on a relatively level paved parking lot. The temperature outside was in the mid-to-upper 70s, and the wind was calm. The weather and road surface were not believed to have been a factor in the incident. On the day of the incident, the victim was working alone while he made preparations to change the oil in a fire department vehicle for the first time. At approximately 1248 hours, the victim was discovered by fire fighters unconscious and pinned under the vehicle. Evidence indicated that the victim was in the process of removing the drain plug, in preparations for changing the vehicle’s oil (socket wrench still attached to the drain plug), when for some unknown reason the floor jack allowed the vehicle to lower onto the victim. When fire fighters discovered the victim situated at an angle under the driver’s side door (angled toward the oil pan), only his legs were sticking out from under the vehicle. The fire fighters attempted to pull the victim out from under the vehicle but were prevented from doing so because the frame cross member and exhaust piping were resting on the victim’s lower chest (see Photo 5). A fire fighter/paramedic discovered that the jack was positioned under the vehicle on the driver’s side just left of the A-post at not quite a 90-degree angle and turned toward the left front tire (see Diagram). The pump arm was sticking out from the driver side front wheel well (between tire and fender well) (see photo in Diagram). It was locked and angled upwards. All of the vehicle’s wheels were touching the pavement, indicating that the jack was not supporting the weight of the vehicle. Note: According to the fire fighter/paramedic and pictures reviewed by the NIOSH investigator, no obvious fluids were noted leaking or on the ground where the jack was first discovered. The fire fighter/paramedic quickly decided to remove the jack but had to lower the jack lifting arm in order to remove the jack from under the vehicle. Note: The NIOSH investigator believed that the jack lifting arm was situated between the lifting point and void space(s) within the undercarriage, making it impossible to remove while raised. The fire fighter/paramedic quickly repositioned the jack under the front of the vehicle toward the left front tire axle joint and began to raise it (undetermined height), when for an unknown reason, the jack lost pressure spraying hydraulic fluid over the pavement and lowering the jack to the ground (see Photo 6 and photo 7). Photo 6. Jack positioned at front of vehicle in an attempt to raise the vehicle off the victim. Note: The jack in the picture is not the jack that was used during the incident but is the same exact model and size of jack and was used to recreate the scene. Photo 7. Close-up of wet, darkened areas on pavement showing the spray pattern of the hydraulic fluid when released under pressure from the jack assembly. Note: The jack in the picture is not the jack that was used during the incident, but is the same exact model and size of jack and was used to recreate the scene. At the same time, two other fire fighters had retrieved hydraulic spreaders from one of the fire department’s apparatus and an individual from the department of public works had brought over another portable floor jack to assist. The hydraulic spreaders were positioned under the vehicle’s frame on the driver side A-frame (see Photo 8). The fire fighters carefully operated the spreaders in an effort to raise the vehicle off the victim. Moments later, the victim was removed from under the vehicle, while still on the creeper. The victim was unconscious, pulseless, and not breathing. He was quickly prepared for transport by EMS personnel and taken to an area hospital where he later succumbed to his injuries. Photo 8. Spreaders raised the vehicle off the victim and enabled the fire fighters to safely remove the victim. The NIOSH investigator traveled to the local police department’s evidence lock-up to inspect the jack. The jack exhibited evidence of repetitive use but visually appeared in good condition. The jack was also easily maneuverable. The pump arm handle was resting at a 90-degree angle (not locked) and appeared to manually operate freely. The pump arm handle could be rotated clockwise and counterclockwise and manually pumped up and down without resistance, however, the pump arm handle would not lock in position when rotated clockwise and the lift arm never rose. The NIOSH investigator noticed that there was a small amount of fluid dripping on the floor while actuating the pump arm handle. Upon a closer examination, the NIOSH investigator noticed fluid bubbling out and around where the universal joint assembly is attached to the thread lock valve in the hydraulic block (part of power assembly) (see Photo 9). The universal joint assembly, which is connected at the base of the pump arm handle, is a joint that allows the pump arm handle to move in most directions through a rotary type motion. It has a threaded end that threads into the hydraulic block, which is the lock valve for the jack. The hydraulic block holds the hydraulic fluid, so when the power unit pump is moved, by way of the pump arm, the jack will go up. The threaded lock valve, when turned clockwise, locks the fluid in the piston area of the jack, forcing the jack to go up and lift the vehicle. The hydraulic fluid is retained in the power unit assembly (the device that holds and pressurizes the hydraulic fluid) through a means of seals, o-rings, gaskets, and bearings. If any of these things were to wear overtime, then hydraulic fluid could leak out of the system, potentially through any cracks, loose areas, seals, o-rings, or thread(s). Following NIOSH’s initial on-site visit, the fire department’s insurance company took possession of the jack to conduct a further evaluation. Note: Those findings were not available at the time of this report. Photo 9. Photo taken from the underside of the floor jack, showing the location where the fluid was bubbling or leaking. The NIOSH investigator noted that the rubber saddle pad was extremely worn and not secured to the lift arm (see Photo 10 and photo 11). Note: The saddle pad makes contact with the desired lifting point under the vehicle. The NIOSH investigator also discovered a circular indentation (that measured the circumference of the saddle) and what appeared to be yellow paint transfer from the jack lift arm’s saddle onto the vehicle’s lift point, which was believed to have been used by the victim (see Photo 12). Note: The NIOSH investigator could not determine beyond a reasonable doubt that the paint transfer occurred during this incident. Photo 10. Saddle pad on lift arm. Note: Jack manufacturer identifier is covered up. Photo 11. Rubber saddle pad not secured to saddle. Photo 12. Photo taken from the undercarriage shows indentation and yellow paint transfer believed left by the saddle. According to the death certificate, the medical examiner listed the victim’s cause of death as due to asphyxiation due to compression of torso. Recommendation #1: Fire departments should ensure that vehicles are adequately supported while personnel are performing maintenance underneath and that vehicles are protected against inadvertent movement. Always use a jack stand to support the vehicle and never the jack itself. Do not move or dolly the vehicle. During this incident, the victim was crushed under the vehicle after it lowered on top of him. The fire department had jack stands available but they were not used by the victim. Prior to beginning any type of work under a vehicle, individuals should always verify that the vehicle is properly supported and stabilized. Recommendation #2: Fire departments should develop, implement, and enforce a comprehensive preventive maintenance program that includes safe work practices. Discussion: Developing policies and procedures on preventive maintenance can assist a fire department in performing scheduled maintenance, outsourcing work to be performed, monitoring maintenance conducted, and inspecting completed maintenance. Performing preventive maintenance on a vehicle can be time consuming and redundant at times, but the overall goal is to lengthen the life of a vehicle and diagnose potential problems before they become costly to repair, take a vehicle out-of-service, or pose a safety risk to the operator and/or passenger(s). NFPA 1911 Standard for the Inspection, Maintenance, Testing, and Retirement of In-Service Automotive Fire Apparatus states that all fire apparatus that could be placed in service for emergency response should be inspected, maintained, tested, and retired as required to keep them in safe operating condition and ready for response at all times.2 Maintenance schedules should be established and recorded as an integral part of a well-planned maintenance program.2 The maintenance program should include daily, weekly, monthly, yearly, and periodic maintenance service checks. The maintenance checks should be based on the manufacturer’s service manuals, the tire manufacturer’s recommendations, and operating conditions. Safety and operational readiness need to be the highest priority when inspecting and maintaining fire apparatus and department vehicles. Establishing a system for retaining records is an important component of a preventive maintenance program. All service records, whether an issue is identified or not, should be maintained according to the individual vehicle and kept for the life of the vehicle. In many cases, problems can only be found by comparing current findings with previous observations/work performed. To assist in detecting maintenance problems and determining when a vehicle has reached the end of its’ service life, maintenance records must be well organized, thorough, and available for review. NFPA 1911 recommends that information from several sources, including the manufacturer’s manuals and NFPA standards, be used to determine fire apparatus preventive maintenance schedules and safe work practices (e.g., preventing inadvertent movement by using parking brake or wheel chalks, disconnecting the vehicle’s battery, and using jack stands). As the necessary maintenance tasks are identified, each should be assigned a schedule based on months, years, apparatus hours, or other appropriate time frame that will determine when it is to be performed and by whom. Once the tasks have been performed, frequency determined, and individuals identified to do the work, the preventive maintenance program can be organized into a series of schedules, check sheets, record sheets, and other documentation that will ensure correct implementation of the program. NFPA 1500 Standard on Fire Department Occupational Safety and Health Program states that the fire department shall establish a list of major defects to be used to evaluate when a vehicle shall be declared unsafe.4 NFPA 1911 specifically addresses criteria for removing an apparatus from service. Once a vehicle is removed from service, the fire department’s designated officer should determine who is capable of performing the required repair work—the fire department vehicle maintenance division or a local vendor. A policy addressing preventive maintenance or repair work should be established to better assist the fire department in making this decision. During this incident, the fire department did not have a preventive maintenance program, policies/procedures for preventive maintenance, or a formal vehicle recordkeeping system. Recommendation #3: Fire departments and municipalities should consider establishing a centralized fleet maintenance facility responsible for all preventive maintenance of all public service vehicles operating within their jurisdiction being sure to develop, implement, and enforce policies/procedures that outline safe work practices during vehicle maintenance. Discussion: An employer must provide a safe workplace for their employees at all times, being sure to keep it free of safety and health hazards. NFPA 1500 section 4.3.1, states “The fire department shall adopt an official written departmental occupational safety and health policy that identifies specific goals and objectives for the prevention and elimination of accidents and occupational injuries, exposures to communicable diseases, illnesses, and fatalities.4 Safety work practices can include not working alone, good housekeeping, clear walking paths, safe and adequate material storage, and identifying a suitable location for work to be performed. The absence of any one of these can lead to an illness, injury, or death in the workplace. This fire department routinely performed their own preventive maintenance on department vehicles within apparatus bays and/or outside within their designated parking lot to save money. Working in areas of this type posed a potentially dangerous situation to the fire fighters of this department by exposing them to vehicular traffic, limited work space, nonsuitable walking/working surface(s), and allowing nonauthorized personnel to walk freely around in that environment. The town’s department of public works was adjacent to the fire station and had its own vehicle maintenance area with open pits for performing undercarriage work such as an oil change. The fire department never used this facility even though it was right next door to them. Municipalities should consider consolidating all vehicle maintenance for different department vehicles into one facility, and employing and/or training/certifying individuals to perform the necessary work under proper oversight. eHow. How to troubleshoot hydraulic floor jacks.External [http://www.ehow.com/how_5206559_troubleshoot-hydraulic-floor-jacks.html]. Date accessed: September 2011. NFPA . NFPA 1911 Standard for the inspection, maintenance, testing, and retirement of in-service automotive fire apparatus. 2007 ed. Quincy, MA: National Fire Protection Association. Manufacturer . Operating manual for hydraulic floor jack. NFPA . NFPA 1071 Standard for emergency vehicle technician professional qualifications. 2006 ed. Quincy, MA: National Fire Protection Association. This incident was investigated by Stacy C. Wertman, Safety and Occupational Health Specialist with the Fire Fighter Fatality Investigation and Prevention Program, Surveillance and Field Investigations Branch, Division of Safety Research, NIOSH located in Morgantown, WV. An expert technical review was provided by Stephen Wilde, a fire apparatus maintenance expert with Certified Fleet Service of Illinois. A technical review was also provided by the National Fire Protection Association, Public Fire Protection Division.